To Kill a Mockingbird by Harper Lee is a novel that I hadn't read in probably 30 years and picked back up upon hearing that my oldest boy reading it for his fifth grade class. 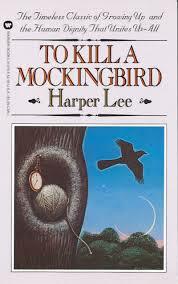 It's a great book and what stands out for me after re-reading it is the character of Atticus Finch. I loved how Lee had Atticus advise his children Jem and Scout to think of how others feel by getting inside their skin and walking around in it, and also how Lee had Atticus speak of needing to do the right thing so he could face his children. Additionally, Lee wrote of how Atticus a deadeye shot with a rifle, but didn't want Jem and Scout to know, and how whether people agreed with him or not, many wanted Atticus to serve the role he did. This manifested both in his appointment to the legislature and in him being named to defend Tom Robinson on trial. It was a character of great quiet leadership that Lee created and the strong views of right and wrong held by Atticus made the interaction between he and Sheriff Heck Tate at the ending of the book that much more powerful.